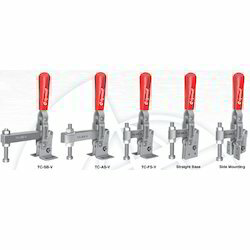 We bring forth our esteemed clients a qualitative assortment of Hold Down Action Clamps that are fabricated from high grade material and advanced technology. We offer these Clamps in various specifications as per the requirements of our clients. Our range is also stringently checked on various parameters to ensure compliance with international standards. We are involved in manufacturing and exporting a widespread array of Horizontal Handle Toggle Clamp. Our professionals make use of high grade raw material and technologically advanced machinery for manufacturing the entire range. These are checked by our quality controllers on several parameters to ensure their best and used in various industries. We also offer our ranges of Clamp to our clients in a comprehensive price range in the market. Clamping Arm 20 sq. , 25 sq. We are counted amongst the foremost manufacturer and exporter of Vertical Handle Heavy Duty Clamp - TC-AB-V-Series. We contrived using top quality materials and advanced technology by industry experts. These Clamp are widely used for drilling and bolting into work position. Our ranges of Clamp are appreciated for its features like durability and high performance. These are available at economical prices in the market. Holding Pressure 430 kg, 580 kg, 1025 kg. Clamping Arm 20 sq, 25 sq. 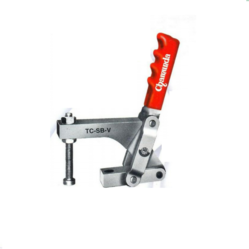 We are a prominent firm engaged in manufacturing and exporting a wide range of Vertical Handle Heavy Duty Clamps - TC-SB-V-Series. Our ranges of products are manufactured using top quality materials and sophisticated technology. 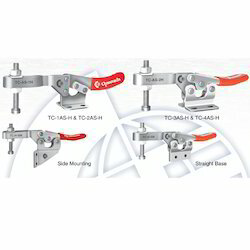 We offer our ranges of Clamps are extensively used for easy welding into work position. Our professionals conduct various tests on the products so as to make sure these are flawless. These are available at affordable prices in the market. We are manufacturing and exporting an exotic range of Vertical Handle Toggle Clamp. These are fabricated using top quality materials that are procured from reliable vendors in the market. 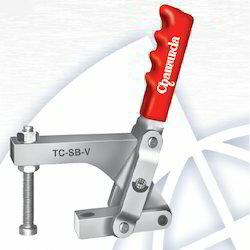 We provide these Clamp in two series and at competitive prices in the market. Our range is properly as per the requirements of our customers. These are mostly used in the automotive industry. We are well known manufacturer and exporter of the finest quality Welding Hold Down Clamps (TCV-FS-SB Series). Our ranges of products are extensively used in welding works and well known for its features like durability, sturdy construction and high performance. We offer our range in different sizes, designs and models, which can be customized as per the requirement of our clients. Clients can avail these from us at reasonable prices in the market. 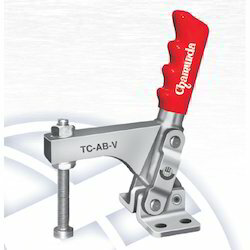 Vertical Fixed Spindle Arms Toggle Clamps series has an angle iron base for drilling and bolting into work position. Clamping arm section made from plate Location of spindle assembly guide bush is Fixed at end of solid hold down arm section. Looking for Hold Down Action Clamps ?